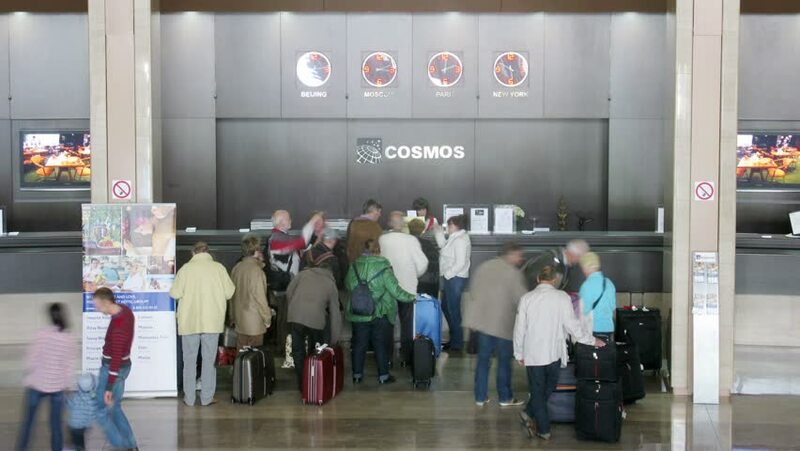 MOSCOW - MAY 07, 2014 (Time lapse): Queue of tourists stands on reception in hotel Cosmos, close-up, May 07, 2014, Moscow, Russia. hd00:17MOSCOW, RUSSIA - AUG 16, 2012: People at buffet tables during photo exhibition Atomic Civilization in the Multimedia Art Museum. 4k00:06HO CHI MINH CITY, VIETNAM - JUL 2, 2015. People at boarding gates in Tan Son Nhat International Airport. Tan Son Nhat is the largest airport located in Ho Chi Minh City, Vietnam. hd00:12KIEV - DECEMBER 22, 2013: Kiev Central Railway Station in Kiev,Ukraine. 1st Railway Station opened in Kiev in 1868-1870 (project by architect Vishnevsky). Now it serves more 170000 passengers daily. 4k00:12New York , March 4, 2019: People walk by a Wolford store in Time Warner Center.